Many examinations and activities place emphasis on skills like remembering and understanding. Unfortunately, this leaves little room for incorporating the Bloom's taxonomic levels of higher order thinking like analysis, evaluation, and creativity. We know from research that teaching our students higher-order thinking skills is one of the most beneficial steps we can take. After all, these are the skills they truly need to succeed beyond school, after all. But do our examinations and activities reflect this need? To help you find out, educator Andrew Churches has devised two very useful Bloom's analysis tools that are available on his website Edorigami. These two tools specifically analyze the Bloom's taxonomic levels of activities and assessments. Moreover, they investigate the balance between higher-order thinking skills (HOTS) and lower-order thinking skills (LOTS). In doing so, they help you improve the taxonomic focus of your exams and activities or units. Download each tool by clicking on the image or the link below it. 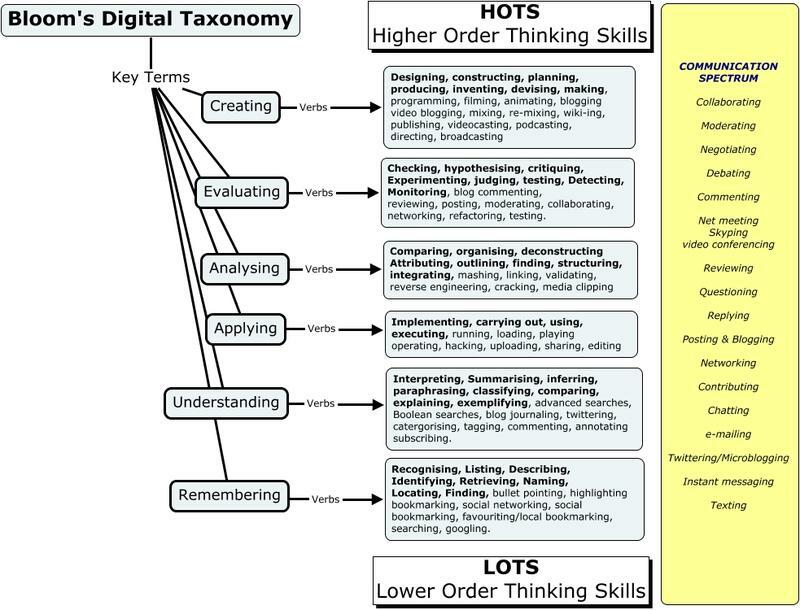 Here is a diagram of Bloom's Digital Taxonomy. Below it is an infographic that shows the Communication Spectrum of the taxonomy. They'll be a handy reference when using these Bloom's analysis tools. This tool analyzes the different taxonomic levels in a test or examination. It uses the action verbs usually associated with each taxonomic level. Begin by matching the taxonomic level to the questions, enter the marks into the corresponding cell, and repeat the process. Next, calculate the percentage of the paper/assessment at each taxonomic level. This will indicate how much of the test's content examines HOTS and LOTS. Analyze each test question matching the question number to the corresponding verbs. Add the mark value for each question to the appropriate column (corresponding to the verb). Total each column and then total the mark value in each category (taxonomic level). Calculate the percentage of the test which is based at each taxonomic level. Ultimately there are no right or wrong values or weightings. However, we know that higher-order thinking skills and processes are preferable to lower-order thinking skills like fact recall or simple repetition of definitions. This tool analyzes the taxonomic level of a learning activity, task, or unit. It gives you a simple overview of the activity or unit and provides a quick perspective on task construction. In addition, an optional extension of the tool requires you to enter the estimated time spent on each task element. Once you've done this, you can calculate a percentage of total time spent on each taxonomic level. Enter the learning activities, elements, or sequences in the first column of the table. Match each activity to the keyword that best corresponds to it. Examine the proportions of the activity at each level. Enter the estimated time spent on each aspect/activity in the columns. Calculate the total time spent on each taxonomic level as a percentage. Hopefully you find these Bloom's analysis tools useful in your own classroom practices. 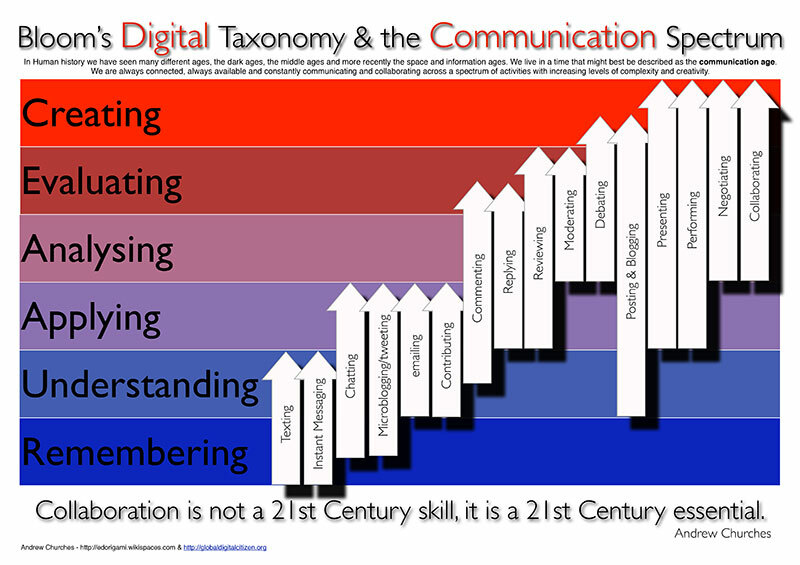 Be sure to share, and visit Edorigami for more helpful info on Bloom's Digital Taxonomy.